Today’s assignment: edit your title and tagline. Make your readers’ first impression a good one! I look at my blog and try to find a perfect name for it. Actually I want to change its name and tagline before but I always don’t have time to do it. Now I’m spending sometimes to think about changing its name and tagline seriously. I have to finish it right now or never. The title is “Tyastlc : My Thought and My Feeling”. Tyastlc is like my identity, it’s my nick name when I go online. All my social media accounts mostly use this nick name. Tyas comes from my name Dian Widyaningtyas. Tlc means tender , love, and care. I really like those words but I can’t explain why. I just like it. But I know some people don’t know the story behind its name. So I want to simplified it. Suddenly I remember Frank Sinatra’s song “From Rusia with Love”. I like this song though I and Frank Sinatra are not in the same age. That song’s title inspires me. 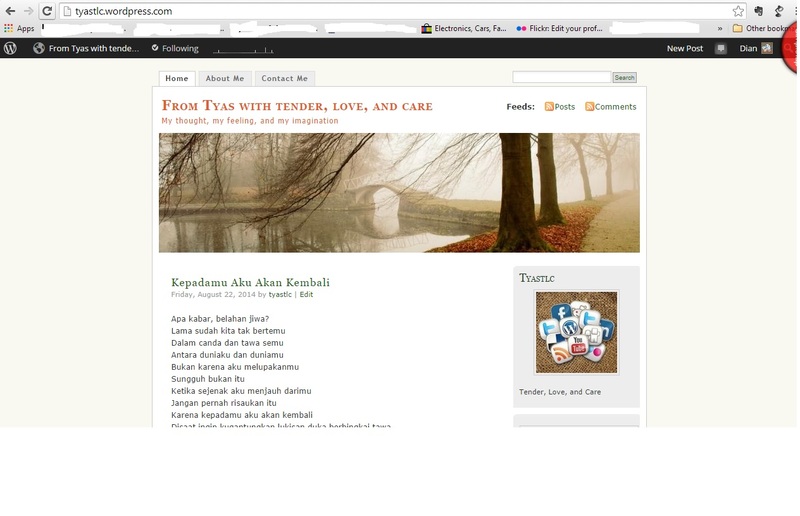 So I change my blog’s title from “Tyastlc : My Thought and My Feeling” to “From Tyas with Tender, Love, and Care”. I want the readers know that I dedicate this blog from my heart. The tagline is “It’s what I think and feel about anything in this life”. I think the tagline is too long and it’s less efficient. So I change it. Now its tagline is “My Though, My Feeling, and My Imagination”. It describes my blog’s conten very well. This blog represents myself. Some people get curious what happen to others, don’t they? So I use this fact to attract them read my blog.